The festive season is upon us, and even though we love the abundance of gatherings, we are sometimes forced to spend time with those special people that we don’t see on a daily basis anymore: our families. In honor of CH2’s 100th issue, we’re offering suggestions on how to enjoy, not dread, the time with your family members this season. It has nothing to do with dazzling everyone with expensive gifts. With a few social graces up your sleeve, you’ll be the hit of the party. Remember that you are an adult now. It’s hard to see all the older adults of the family and not revert to being a 12-year-old again. For example, let’s suppose your grandmother says she doesn’t care for your hairstyle. Instead of putting on your “rude kid” hat and snapping at her, only to be reprimanded later by another family member for doing so, try a calm reply. Act like an adult when you see your family members. Even if you’re the youngest, you can command the respect you deserve. Simply voice your opinions in a mature manner and explain why you feel the way you do. Who knows? You might just inspire them to act more grown up, too. Put aside past resentment. Most of us hold a grudge or two against one or more family members. Whether it’s for something major or an old, petty disagreement, put it aside for the sake of the other relatives who are hoping to enjoy the togetherness of the season. Let’s say you haven’t seen a certain sibling since he or she disappeared to the West Coast all those years ago and never sent you a single postcard or called once. It’s best not to address how you feel during Christmas dinner or any time when your mother is simply glad to have you both under the same roof again. Put a smile on your face; hug your long-lost sister or brother and ask about how life is going. It’s not as difficult as you might think. Don’t bring up sad topics. One of the reasons children enjoy the holiday season markedly more than adults is that they know how to have fun. Make it a point to keep the holiday season lighthearted by avoiding topics that might bring about a sense of melancholy, such as friends who moved away long ago, death or divorce. 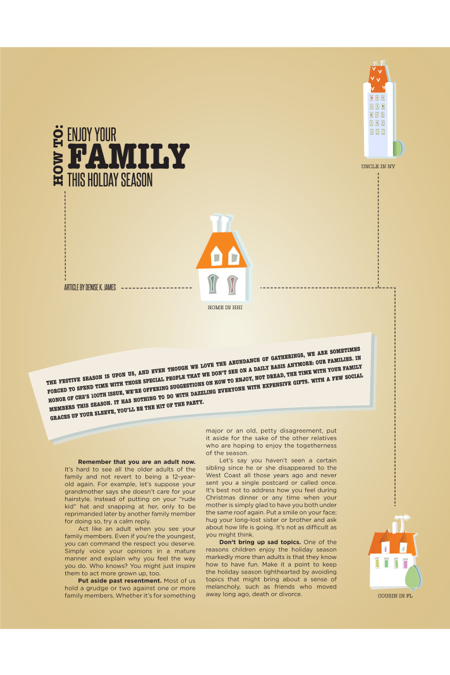 Beyond your personal family life, try to focus on the positive during the holidays. And don’t miss the opportunity to open your heart and extend well wishes to those who might be down on their luck this year. If you know of a family who struggles with purchasing gifts, for example, why not offer to bring them a few surprises? Not only will you feel great about yourselves as a family and enjoy the bonding experience, you’ll also be helping someone else. Keep a sense of humor. We know… There’s that relative whose sense of humor or idea of a good time simply grates on your nerves. Maybe he or she is known for drinking a bit too much of the hot buttered rum, making off-color jokes about politicians or harassing you about your “artsy” boyfriend and his “weird” boots. It’s best to keep your sense of humor for the time being. And what if you flat-out don’t find him or her funny? You don’t have to fake a guffaw at a crass joke, but learning to gently guide the conversation in another direction—without scolding the family member in front of others—will ensure that everyone else’s discomfort is alleviated. For instance, if your successful cousin insists that you can’t possibly manage to save money while working full-time in a bakery, change the subject slightly by asking your grandmother for her bread recipe. Suggest new traditions but honor old ones. When you were a child, the holiday season was completely different—from the ways your parents behaved to what you ate for breakfast to how soon you decorated the tree. Right? And it was awesome, because those were the circumstances at that time. Now you’re older, and, let’s face it. A few of those old traditions need to be replaced, particularly if your mother gets a little downtrodden every time she thinks about the fact that her children no longer live at home and follow her around the backyard at dusk. The trick is to suggest a few new traditions but also to honor the ones that are time-tested and still bring your family members joy. You’ll know the difference when you see it. If your father gets choked up looking at an old reindeer ornament that you made when you were six years old, get him something new to hang on the tree—still from you, just slightly updated in meaning. Bring something to the party. Now that you’re grown, don’t automatically expect everyone to feed and entertain you, even if you’re going to your parents’ house. Instead, think of something that you can contribute to the festivities. The most obvious answer is a food item, but, if you aren’t skilled in the kitchen, don’t worry. There are other possibilities. If you are hung up on bringing food, try something simple, such as sweets (no one ever said no to boxed brownies, as long as you don’t burn them) or a dip. Other ideas for contributions might include a party game that everyone can play after dinner, old photographs of the family or an original song or performance of some kind. Be creative. Offer to keep in touch. The best way to end a gathering of family and old friends that you don’t see regularly is with the promise to keep in touch. You might secretly wonder whether you’ll actually have time to grab coffee with a cousin between now and next year, but the intention matters most.